In order for the IP addresses to be unique across the world, the Internet Assigned Numbers Authority (IANA) regulates their use by assigning regional Internet Registries (RIR) to Internet Service Providers and other regional entities. Since the growth of the Internet, the sequence of IP Addresses, which are a sequence of dotted decimal numbers, are about to run out of unique combinations. In order to accommodate the growth in the devices that need to be connected on the Internet, IPV6 was created which is able to accompany a great deal more of sequential combinations. Another feature about IP addresses is that they are mapped geographically. An IP address, before it is assigned, is registered with a location and address so that best-practice principles can be promoted on the Internet. 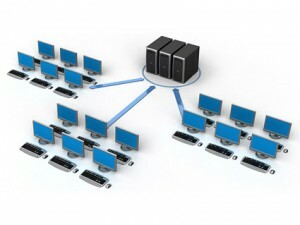 Between each computer and web-server is a network of other computers, servers and hubs that act to keep the connection alive. If you enter a particular website address on your browser, your computer would send a request to other specialized computers called "name servers" to locate where the website is. The website address you enter on your browser is called a "URL" (Uniform Resource Locator) , should it match any entry in the name server, your computer will be instructed to locate the website on a particular IP address. This is what is referred as a "forward lookup", where the address you typed in needs to be located on the Internet. There are many name servers on the Internet, almost one in every network there is, that can easily number up to more than one million. Using a caching service, each of those servers make sure that they have the same entries globally, rarely will you find a URL being translated differently from different locations on the Earth. Whenever a particular name server realizes that it cannot find the entry in its database, it queries other name server that is nearby or in its list to offer a translation. This is called a "recursive query". 2. After monitoring the traffic on your network, you discover an IP address connection that looks suspicious and you might want to find out more about it by determining which URL it belongs to, and if it is not assigned to any, at least where it is located. 3. You may also want to determine whether your IP address registration has been correctly configured at the name server. In this case, a reverse lookup will give you the appropriate information. A reverse lookup can also be used by routing and server equipment on the network to determine the best path of communication. These devices are configured to locate paths that are the easiest to follow so that you can browse the Internet without hiccups. For instance, a router will perform a reverse lookup not to find the URL or domain name, but to determine the geographical and path information that it can follow to establish a connection you may have initiated, like a Skype call or a chat. Almost every name server can perform a reverse lookup. The servers, however, are not designed to interact with Internet users, but with other computers. This free tool will allow you to perform a reverse DNS check. To perform the lookup, you need the IP address that you want to translate. The test will give you the domain name, which is not necessarily the URL, that can be used to perform other tests like a forward lookup to determine the registry information.